"All he can do is consume. He's pursued by demons that are probably just in his own head. And even if he does manage to escape by slipping out one side of the maze, what happens? He comes right back in the other side." A video game mechanic where the edges of the screen are hyperspatially connected: move past the left side, and you appear on the right. Or walk to the south, and suddenly you're in the north. It serves as an alternative to the Invisible Wall that would normally be present if one tried to walk off the screen. How this trope is applied differs by the game's genre. In a Platform Game, typically only the horizontal directions wrap around, loosely implying that the game world is cylindrical. In other games, it's common for all four directions to wrap around, with the slightly more confusing implication that the game world is shaped like a torus. Some games have used this mechanic in certain Gimmick Levels. Wrap Around in some older games can also be unintentionally present and can be exploited only by using glitches. Tool-assisted Speedruns often exploit it. Four-directional wraparound is quite often used in Role Playing Games' world maps - see World Shapes. Not to be mistaken with Wraparound Background. Popeye, but only on the top floor of the first stage (with Popeye and Olive's houses) and the second floor of the second stage (with the springboard). They're marked with arrow-shaped signs reading "THRU". Wrecking Crew has a horizontal wraparound passage on every floor. Frogger has the assorted obstacles and platforms wrap around, but if the player tries it, they lose a life instead. In the Atari 2600 version of the game, a player can wrap around without losing a life, depending on difficulty settings. Most Pac-Man games contain one or more "tunnels" that wrap around to the opposite side of the screen. The monsters can use them just as well as Pac-Man can, but only Pac-Man goes through them at full speed. Wizard of Wor similarly featured Escape Doors connecting the left and right ends of the dungeon mazes for players. Worluk, however, would use them to quit the level entirely. Astro Man's stage in Mega Man 8 has horizontal wraparound. Some of the invaders in the Space Invaders Extreme series wrap around right-to-left, descending a little lower as they do so. In the MSX version of Parodius, one of the powerups simply turns left-right wraparound on for 30 seconds. In a stroke of game design genius, this power is required to get past a solid impassable wall in the last stage. Touhou 8: Imperishable Night - Reimu can do this if you fight her in Stage 4. Bonus points due to it appearing to Reimu herself that she's only flying in a straight line and apparently unaware she's doing it. Touhou 10.5: Scarlet Weather Rhapsody - Yukari can wrap around either wall as an escape technique. Touhou 11: Subterranean Animism employs horizontal wrap-around as Reimu's special ability when paired up with Yukari. Touhou 14: Double Dealing Character's That One Boss, Seija Kijin, has, as part of her Personality Powers repertoire and attacks that screw with the player, patterns that has her fire bullet upwards and wrap around so they come at you from the bottom of the screen. True to a ridiculous extent in Cortex Command, in which, on a small or mid-sized map, a weapon with sufficient muzzle velocity can fire a projectile that circles the world and ends up blowing off your own head. Metal Storm has vertical wraparound, especially in Stage 2 and Stage 6. It allows the player to fall indefinitely instead of into a Bottomless Pit and lets enemy harass you from both above and below. Scorched Earth lets you change the behaviour of the walls, including making them act like concrete (missiles explode when they hit it), padded (missiles bounce off slower), rubber (bounce off at same speed), spring (bounce off faster), and of course, wraparound. Karoshi series often utilizes this variation in often clever ways. Action52 has several games to include that mechanic. Sometimes intentionally, sometimes not. Happens vertically in Yar's Revenge. Super Mario Galaxy and its sequel provide the same effect without the hyperspace element by having some side-scrolling levels in a cylinder. Some older games did this too, such as Battletoads and Dynamite Headdy. In the NES game Super Dodge Ball, one could hit an opponent so hard that they do this a few times, and it's even possible to get them to land on your side if you do it right. Purple uses horizontal wrapping in vertical sections. Things that chase you (like your frisbee, or some enemies) still respond to your position relative to the screen, making situations where you can put player character on one side, toss frisbee through the edge and watch as it repeatedly whacks an enemy on the other side of of the screen trying to get back to you. The Sonic the Hedgehog series have vertical wraparound at several points, such as in Labyrinth Zone and Ice Cap Zone. Sonic 3 & Knuckles, since the two acts of each zone are Direct Continuous Levels, also has hidden horizontal wraparound, which means with the right glitches, you can loop back to a zone's first act, resulting in the graphics glitching up. Civilization and its clones use flat cylinder-shaped Earth. Animaniacs had a PC game set released; one featured Dot in a Mario Brothers-like game, but shooting limited ammo horizontally rather than hitting platforms. Dot and enemies both could warp around. Dot could even warp around to get hit with her own shots ... for limited invulnerability. The SNES game features this in the final boss battle against Pinky and the Brain. Taking advantage of it is the best way to avoid their attacks. Rockman 4 Minus Infinity had a vertical wraparound section as an homage to the Labyrinth Zone. There is a secret path hidden in the blocks. In Flicky, the screen would scroll horizontally, but wrap around before too long. In Nuts & Milk, the left and right sides of the screen were connected for Milk. In Alpiner, wrapping from the left side of the screen to the right, or vice versa, was useful for avoiding trees. You could actually climb while straddling the wraparound border. Bubble Bobble, but vertically instead of horizontally. Doki Doki Penguin Land had horizontal wraparound at the very top of the screen, to which the penguin would go after falling off the bottom of the screen, which is odd because dropping the egg would reveal more level below. There is one area of one dungeon in Live A Live with horizontal scrolling. Otherwise, the whole game world is closed off. Super Arabian has this for pages 3 and 4, although it only works when you jump. The Fairyland Story allows wrapping from left to right if there are high enough platforms to jump over the walls, and certain stages have pits in the bottom floor where anything that falls in reappears at the top of the screen. Door Door has arrows indicating platforms which wrap from left to right. Earnest Evans doesn't use it in gameplay, but every level wraps around horizontally, likely just due to how the game engine works. The BlazBlue series allows Arakune to wrap to the other side of the screen by airdashing against a wall. Balloon Fight features this in every level. It even carries over into the stage based on it in Super Smash Bros. for Nintendo 3DS. North And South has horizontal wraparound in the battle stage, which helps prolong battles since individual units are not permitted to move backwards. Nidhogg features this as a Comeback Mechanic. The player who is on the defensive has the option of running off-screen to respawn in front of the leading player if they can't catch up to them. Levels 8 and 10 of Dangerous Dave feature open pits at the bottom of the screen that, when you fall through them, drop you atop the ceiling of the level. This is, in fact, necessary to complete those levels. "Sometimes, space just all like warps in on itself, y'know?" Space War and its Spiritual Successor, Asteroids. As well as Star Control, which uses a similar battle system. In ChuChu Rocket!, characters will wrap around the edges of the playing board. In particular, a Chu and a Kapu will miss each other is they wrap around the screen at the same time. It can take a lot of trial and error to perform this trick on puzzles that revolve around it. As mentioned above, all sorts of Role-Playing Games with world maps do this. Most every Final Fantasy, for instance. Notable in Final Fantasy I in that all maps featured this, not just the world map. Most maps had "exit tiles" set in places that prevented the effect from being visible but at least one town allowed the player to see back to where they came in if they went far enough to the right and one dungeon treasure required walking down a narrow corridor to the right to get back to the far left of the map. Lampshaded in this RPG World episode (as seen above). Defied (but not quite averted) in Final Fantasy VIII. When you bring up the mini-map on the overworld for the first time, the world is projected onto a sphere. Toggling the mini-map again switches to the classic flat map. In fact, the map wraps around in four directions, but the globe mini-map uses clever tricks to give the illusion that the world is a sphere. Similarly, Secret of Mana's world map was a wraparound square, but when flying over it on Flammie, pressing START would display the map in a globe-shaped manner. This becomes a plot point in Skies of Arcadia, when the crew decides to be the first to sail around the world after the acquisition of the Blue Moon Crystal. The freeware game Jumpman plays with the wraparound trope by making the wrapped area smaller than the screen, revealing copies of the room and the player to the left and right. Some levels, including treasure rooms, in Gauntlet and Gauntlet II have this property. Tetrisphere does this so you can scroll across the playfield in any direction without the orientation changing, but it keeps just a circular portion of the field visible at any time so it looks like a sphere. The arcade version of Indiana Jones and the Temple of Doom has levels which loop on all sides; the NES version uses 2D wraparound because many levels have lava pits at the bottom. Technically Bosconian has this; it occurs on the "radar" screen. The entire main area in VVVVVV and some rooms themselves as well. In fact, this is one section's entire gimmick. King's Quest I the kingdom of Daventry wrapped around after six screens in a direction, both horizontally and vertically. King's Quest II, III, and IV had their worlds wraparound vertically, but not horizontally. Only from King's Quest V onward did the wraparound actually cease. Action Biker on Atari 800/Commodore 64 does to. Probably due to the small world, its even more obvious than other games listed. Solium Infernum has a wrap around map. Aesthetically, it shows Hell is a strange place. Strategically, it means your territory can completely encircle the map or flank an opponent. In Portal, you can easily create a wraparound effect by placing portals on opposite sides of yourself (and at any angle), and this is an important mechanic for solving the game's many fiendish puzzles. For example, portals placed on the floor and ceiling of the same room create a space through which you can fall infinitely. Populous: The Beginning. The world is a globe, completely round, which is very rare for a Real Time Strategy game. Monster Truck Madness 2: Drive in any direction in a straight line and you'll eventually get back to where you started. There is no border on most or all of the maps. The 2D/2.5D entries in the Mortal Kombat series feature teleport moves that work this way, both horizontally and vertically. 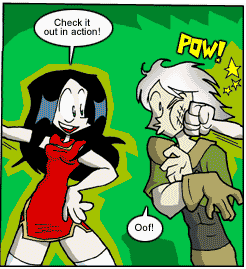 Rain's roundhouse kick is notable for causing the other player to do this. Almost every map in Yume Nikki does this. Makes much more sense than most examples, because hey, it's a dream. Some versions of Snake have wrap-around. Freeware game Fetus and its sequel, Sutef. Except when it doesn't. Used primarily to mess with the player's spatial senses. Various hallways and exits can take you to virtually any part of the Antichamber complex, and you often cannot go back the way you came. The end section of the game features a seemingly endless open area consisting of walkways connecting towers and decks. The Bottomless Pits in this area actually loop around—falling off of a walkway just means you'll come down from above your starting position in a few seconds, which is necessary to reach the end. If you exploit the fact that you can stand on the black block, you can even skip the entire puzzle by just jumping off the starting bridge. A Trip in A Tree from Something Else is an homage to World 5-3 from Super Mario Bros. 2. It even uses enemies from Super Mario Bros. 2: the Bob-Omb and Albatoss. Seija Kijin has access to this ability in Touhou 14.3: Impossible Spell Card via use of an item called the "Gap Folding Umbrella". World Destroyers, playing like Asteroids, has four-dimensional wrap-around which is visually represented, resulting in strange situations like a ship with different parts of itself on all corners of the screen. Enemies and Homing Projectiles see through the wrap-around as well. All the RPG Makers have the option to create maps that loop horizontally or vertically or in both directions. This feature is oddly absent in RPG Maker XP, but thankfully there are scripts for this. It's also generally suggested to be used for The Lost Woods to give the illusion of being definitely, positively lost. Both of the main stages in Killer Queen have horizontal wraparound, but one of them also has holes in the bottom platforms that lead to the top of the stage if they are jumped through. Transcendent tears in The Binding of Isaac: Afterbirth are a lot like this. If they go through a wall, they come out the other side. Several Afterbirth items give you transcendent tears, while the battle with Hush incorporates these tears in its Bullet Hell sequences. Chrono Trigger uses this kind of torus-shaped world, unfortunately the ending shows the planet to be spherical. Doom mapspace will "wrap around" when reaching the borders, though no official map ever extends this far. This can be seen using no clipping; running in one direction away from the game world will eventually result in the player approaching it again from the other side. Player-made maps can take advantage of this though a level of such size can cause issues in some ports of the game. Additionally, strange effects occur at the "border" of the mapspace, notably with monster pathfinding not considering the open border of the mapspace to be a valid pathway. Terry Crews does this in one of the Old Spice commercials, where he punches a guy to his left by sticking out his arm to the right. The "Vid-Grid Pac-Maze" in Mr. & Mrs. Pac-Man Pinball utilizes four-way wraparound. This is an important aspect of the "closed universe" of The Land Of The Lost. If you travel far enough in one direction, you wind up back where you started. If you climb the tallest mountain and look at the next peak over through your binoculars, you'll see your own back and realize it's the same mountain, endlessly repeated to create the illusion of an infinitely long mountain range. The subway in The Matrix Reloaded. In Greg Egan's Orthogonal trilogy, spacetime is a closed loop in all dimensions, which means the entire universe is both a Wrap Around and a Stable Time Loop. This is a feature of at least two variations of the game of Chess. Cylinder Chess posits a board which the players need to view as a cylinder — i.e., the two sides of the board are visualised as wrapping round into a cylinder, so that a piece may apparently leave the board on one edge and return in the appropriate square on the other side as one continuous move. In the Discworld continuum, this is further refined in the specialised game of Assassins' Chess - two extra files are added so the board is eight squares long by ten across. Specialised rules cover transitions across opposite sides, but the new Assassin piece may more or less move where it wants and the Assassin's Pawn has extra abilities. (as befits an Assassin's assistant and operating back-up). Although intended only as a throwaway aside in the books, clever people have codified the rules and made it playable. While seemingly ruled out by newer observationsnote Unless the Universe was too big (and too young) to be very difficult or even impossible for us to determine if this actually happened or not, some astronomers have suggested the Universe could be smaller than the observable Universe, in which case what looked like distant galaxies would actually be close ones, those images formed by light that had time to circumnavigate the Universe since having been emitted. A hypothetical (intergalactic) traveller who went on in an Universe of this type would find again and again, in a way similar to the Land of the Lost example detailed above, the same galaxies (albeit changed because of their evolution during the ages and thus usually being difficult to recognize them). On a smaller scale: Since Earth is round, Truth in Television to some degree, but we would have be much larger in relation to Earth to get the trope effect. (Still, it's frequently used as a you-can-see-your-own-back-of-the-head-in-the-telescope gag in cartoons.) In the last stable orbit around a black hole (where light goes in circles) this effect would be real, though. Tower of Babylon is a retelling of the Tower of Babel story by Ted Chiang, where God has not struck down the tower (everyone's a little nervous about His silence on the issue) and it has ascended to well past the moon and hit a ceiling. The protagonist is part of a group of miners brought in to tunnel into Heaven. After a series of accidents he becomes separated from the group and ends up ascending through a series of caves and ends up back on the ground. He then realizes the tower didn't incur God's wrath because mankind wasn't going anywhere. Red vs. Blue: One of the show's "Please subscribe" eyecatches has Caboose jump off-screen after delivering the advert, only to appear from the opposite side and wonder "What the heck just happened?" The Inexplicable Adventures of Bob!— When our heroes are held captive on an infinitely flat plane on the Cone Ship, they wonder if the artificial landscape may be recursive, "like a video game." Voluptua: "If this place recurses, it's still big. I can't see our backs on the horizon." Always present in the German children channel (Kika) night program with poor "Bernd das Brot", where every attempt of Bernd to leave the screen runs into this trope. He constantly lampshades this joke as lame and overused, but his tormentors couldn't care less. The song "Schaffhausen ist eine Illusion" by Swiss band "Die Aeronauten", who boldly declare their hometown is...well, not real. "eine Hohlwelt als Hologramm - wo ich weggeh, komm ich wieder an"